Win Tabletop Wargames Designers and Writers Handbook! 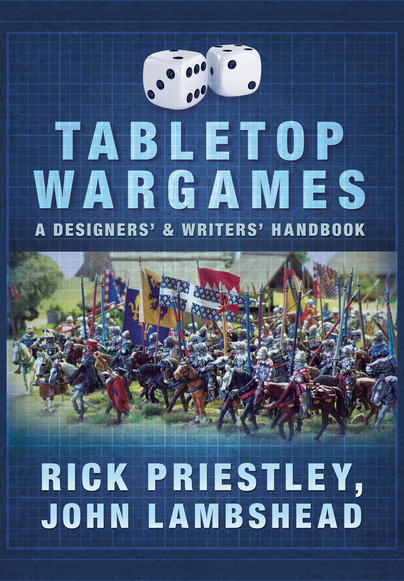 I'll soon be reviewing Tabletop Wargames: A Designers and Writers Handbook by R Priestly and J Lambshead, recently released by Pen and Sword publishing. In the mean time you can win a copy all for yourself! Last day will be 12th October! Winner announced 13th October. As I am currently developing my own wargame, I'd love to take a look at this great book. Of course I promise to spread the word of this nice blog as I already enjoy it now! I'll do it even if I don't win! Like this Blog so much, especially the interviews. Of course I will spread the word. Sounds like an interesting book. And a very diverting blog - congratulations. Good Luck. I will need a name for the draw though:). Thanks for the praise. Very interesting blog. I do swear that I will pass the word whenever possible! I don't know your block, but I will try to read it. I will spread the word of the word of this blog. The book might tighten up my thinking on designs, maybe even make some of them playable! I give a very solemn oath to spread the word about your blog! blog looks great, i will clue folks in, thanks! I would be very happy to spread news of the blog high and low--indeed, I'll mention it the next PAXsims update (http://www.paxsims.org)! Spreading the word of the blog right now. Keep up the good work! Going to start browsing the archives now! Hope you enjoy. Good luck! That is a nice prize. I will of course spread the word. As someone who has designed a few tabletop wargames in my time, I always find the designer's notes very interesting to read as they can give one lots of new ideas, especially if they have approached a similar problem from a different perspective. I look forward to your review of this book. Please enter my name into your book drawing. Thanks for letting us know about the new book. I await your comments with a mix of interest and curiosity. I also promise to spread the word, on my blog. Big thanks and good luck! Let this blog to prosper and to have millions of followers! Cool, I'm up for this. Looks like it will be an interesting read. It should be interesting to read what wisdom the creator of Warhammer and Warhammer 40K has to impart on us neophytes/acolytes. No problem, no need for apologies. Just curious. MASSIVE CONGRATULATIONS TO JOHN CURRY!! MY DAUGHTER DREW YOUR NAME OUT OF A CUP!